10 "Strength Training" Commandments For Wrestlers! In part one of this series I discussed some tips to keep your strength and muscle, or even gain some during the wrestling season. In part two of this series I will give you ten sure-fire tips for improving your “wrestling strength” and therefore your wrestling performances. These tips apply to both in-season and off-season training. The posterior chain muscles are comprised of the glutes, hamstrings, and lower back. 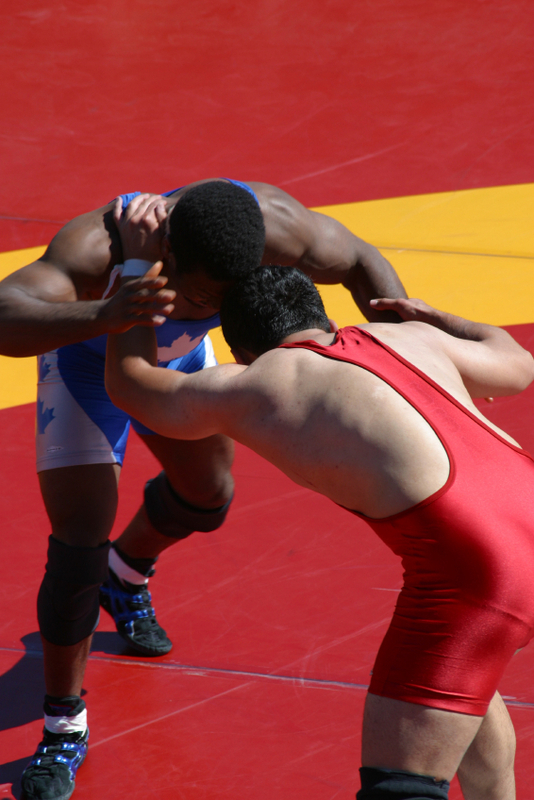 This extremely powerful area of the body is a key section to overall wrestling performances. By improving strength in this area you will notice a marked improvement in speed and power in the neutral and bottom positions. Some exercises that you might want to consider in order to work the posterior chain are good-mornings, stiff-leg deadlifts, deadlifts, barbell squats (bar low on shoulders). My two favorites are the reverse hyperextension and the Russian glute-ham-gastroc machine. They are the ultimate in working the posterior chain muscles. You want to be fast and strong on the wrestling mat. Don’t think that you should throw weights around when you strength train though. When wrestlers try to move a barbell quickly in their workouts, they are using momentum to help move the weight. You should minimize momentum, and maximize the amount of muscle that gets worked by slowing down. How fast (or slow) should you move a weight when strength training? When you are raising a weight (or contracting the muscle) try to do it in 2 seconds. When you lower the weight, do it twice as slowly. You should take about 4 seconds to lower a weight. Your workouts should never exceed 35 minutes in duration. If they do, YOU”RE NOT WORKING HARD ENOUGH! By completing your workout in no more than 35 minutes or so, your body’s hormone levels are optimal. Your ability to recuperate from the workouts, and therefore develop more strength, is increased. Avoid long, drawn-out strength training workouts. They will eventually cut into your body’s ability to recuperate, and lead to over-training. When I develop sport-specific strength training routines for my athletes, I always adhere to this. This number of exercises will allow you to hit the “wrestling muscles” with just enough, but not too much. Any more will almost guarantee that you will send your body into an overtraining syndrome. Read this one carefully, and try to really absorb the content. You should do no more than two work sets (the sets that count. These don’t include a warm-up set) for any given exercise. If you are working hard enough, this is plenty. You do a warm-up set for an exercise, then move to your top weight. After you complete that top weight, reduce the total weight on the bar or machine by 20% and repeat. If you are really training intensely, you can do just one work set per exercise. This is the ideal. If you can hammer a muscle with one perfect set of an exercise, there will be no need for another set. I advocate a second set with a 20% weight reduction because many people don’t quite hammer that muscle with one set. Other than your warm-up set for each strength training exercise, you should train your sets to “momentary muscular failure.” This is the point where you can no longer complete another repetition with perfect form. By training to momentary muscular failure, you are forcing the muscles to adapt, and therefore get stronger. Let me clarify training to “failure.” Training to failure is not “almost taxing the muscle.” It is the point where you cannot push or pull another repetition no matter what. Is it safe to train this way? Absolutely! The first few repetitions of a set are actually more dangerous. When an athlete is not using good form, and slower speed, it is usually during these first few repetitions that an athlete gets hurt. There is a common misconception amongst athletes and coaches that you must use free weights when strength training. Free weights are great! So are machines! Your muscles don’t know the difference. The intensity is the most important thing when trying to improve your strength for wrestling. The tool that you use to get there is not. I like certain exercises for certain muscles. It also depends on injuries that a wrestler might already have. You can work “around” and injury and still give the body a thorough strength workout. If you have access to Hammer Strength machines, I highly recommend that you include them in your wrestling strength workout. If you don’t have access to a thick bar, get one. This is usually a hollow metal tube that you put free weights on the end of. A thick bar forces you to hold on tightly when performing exercises. It develops fantastic forearm and hand strength. It should be part of every serious strength training program for wrestlers. You can do curls, reverse curls, rows, and presses with it. Whether you are trying to cut weight or go up a weight class, you need regular feedings of protein. Protein helps to repair and rebuild muscle tissue. It is vital to keep up protein feedings if you are trying to cut weight… unless of course you don’t mind losing muscle and getting weaker. Try to get at least 5 protein feedings per day. The difference lies in the carbohydrate intake. If you need to cut weight, you should begin slowly dropping carbs, but never completely. You can’t wrestle if you have no energy. Carbohydrates are you body’s preferred source of energy. Contact me at steve@sports-strength.com if you’re interested in a personalized meal plan for wrestling. The trap bar is another incredible piece of equipment when trying to gain wrestling strength. The trap bar is a hexagonally shaped bar. It allows you to perform deadlifts with maximal stimulation of almost every muscle vital to improved wrestling performance. If you’ve never seen one, do a search on the web. This is an exercise that all of my wrestling clients use. It will make your entire body stronger. If I were limited to only one exercise in order to increase the strength in my wrestlers, this would be the exercise that I’d choose.